The Smalcald Articles or Schmalkald Articles (German: Schmalkaldische Artikel) are a summary of Lutheran doctrine, written by Martin Luther in 1537 for a meeting of the Schmalkaldic League in preparation for an intended ecumenical Council of the Church. 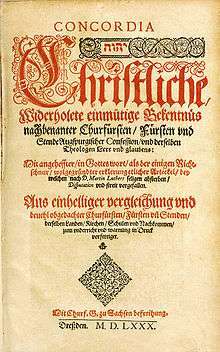 Luther's patron, Elector John Frederick of Saxony, asked him to prepare these articles for the Schmalkaldic League's meeting in 1537, held again in Schmalkalden. The League had been organized in 1531 as a union of various Lutheran territories and cities, to provide a united military and political front against Roman Catholic politicians and armies, led by Emperor Charles V.
When the Schmalkaldic League met, Luther was taken very ill with a severe case of kidney stones and so was unable to attend the meeting. The league ultimately determined not to adopt the articles Luther had written. They were influenced not to adopt the Smalcald Articles by Philipp Melanchthon, who was concerned that Luther's writing would be regarded as divisive by some. Melanchthon was asked to write a clear statement on the Papacy and this he did, a document that was adopted at the meeting as the Treatise on the Power and Primacy of the Pope. In the Smalcald Articles, Luther summarized what he regarded to be the most important teaching in Christianity. The Articles were highly prized by John Frederick who ordered that they be made a part of his last will and testament. And though they were not adopted at the meeting of the Schmalkaldic League in 1537, they were widely used and were incorporated into the Book of Concord in 1580 as one of the Lutheran Confessions of the faith. Although the intended Council was never held, the Smalcald Articles were seen as a supplement to the other Confessions of the Lutheran Church and are still used today. They are included in the Book of Concord. Bente, F., translator and editor. Concordia Triglotta . St. Louis: Concordia Publishing House, 1921. Russell, William (1995). Luther's Theological Testament: The Schmalkald Articles. Minneapolis: Fortress Press. ↑ Martin Luther, The Smalcald Articles: Second Part, Article Iin Concordia: The Lutheran Confessions. Saint Louis: Concordia Publishing House, 2005), p. 289. "The Book of Concord: The Lutheran Confessions of 1529-1580". Look for: The Smalcald Articles of Martin Luther (1537). Retrieved 25 March 2011. "Schmalkalden, Articles of". Encyclopedia Americana. 1920.